Bua (meaning 'victory' in Gaelic) opened in 2004, and is a perpetually busy East Village institution for rock 'n roll, killer bar food and great happy hour deals. Rooted in the gritty downtown vibe of New York's punk rock history, the bar is unpretentious and unassuming, with top notch food and excellent drinks. 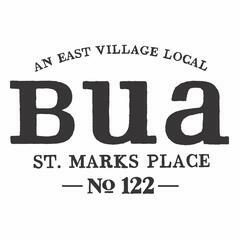 Bua's cozy interior is as welcoming for an after work pint, a late night burger and a shot, a boozy Sunday brunch or an afternoon of summer day drinking on the outdoor patio. New York Magazine describes Bua as "a comfy bar full of Tisch and Cooper Union students"; Thrillist calls it "a real bartenders’ bar" and Time Out calls its outdoor seating "perfect for watching the pedestrian traffic near Tompkins Square Park." Bua has also been featured in The Infatuation's guide to the best happy hours in New York City and Thrillist's "18 Reasons Why NYC's Bar Scene is the Best." <br><br>Bua is part of Sleeping Giant NY (harri.com/sleeping-giant-ny), a family of independently operated bars united by a shared work culture and the chance for employees to grow and explore opportunities across different locations. To learn more, please visit www.sleepinggiantny.com.